How to backup Blu-ray to H.265 MKV, MP4 or MOV format? Are you looking for the best Blu-ray Ripper software to convert Blu-ray to H.265 MKV, H.265 MP4, H.265 MOV or H.264 files? 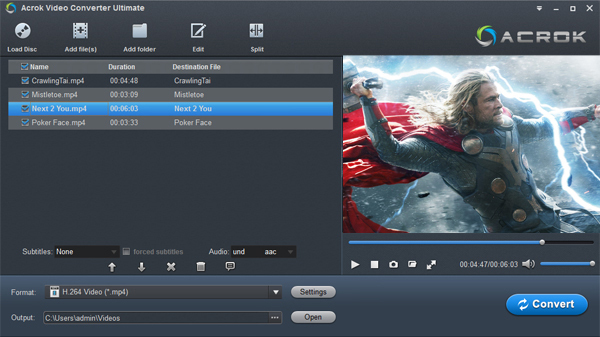 In this article we will share the best blu-ray ripper software which can convert blu-ray disc, blu-ray ISO or blu-ray folder movies to H.265 MKV, MP4 or MOV format, and you can also use it to rip blu-ray to H.264 files, 3D Blu-ray movies are also supported to convert. How to backup Blu-ray to H.265 files? “Hello, recently I want to backup my blu-ray disc collections to H.265 files and then save on HDD. I am thinking about getting your Ultimate Converter Package but some questions. I tried a trial with sample and had a Blue Ray Star Trek movie that I wanted to convert over to a H.265 Video. Well it was taking less time compared to the program I used before. There are 2 programs similar to yours called Make MKV and DVDfab, but I think your program is better than them. I am trying to rip my blue ray collection to the best quality format for the computer/TV. What would be my best format? I hear MP4 or MKV but from what I read the H.264 and H.265 were the better ones. The question showed above is asked by a blu-ray user, he want to backup blu-ray to H.265 or H.264 videos in the format like MKV, MP4, MOV, etc. maybe you also have the need to backup Blu-ray to H.265 MKV, MP4 or MOV format, in order to help you backup blu-ray movies easily, we want to introduce the best Blu-ray Ripper software for you, the program is called Acrok Video Converter Ultimate, it’s the best blu-ray ripper software on the market, it has the ability to convert purchased blu-ray disc movies to unprotected common videos, such as convert blu-ray to H.265 MKV, convert blu-ray to H.265 MP4, convert blu-ray to H.265 MOV, etc. the main features are showed below. Download and install Acrok Video Converter Ultimate on your computer, run it you will see the main interface, to load blu-ray or DVD disc movies, please click “Load Disc” button on the top left corner. 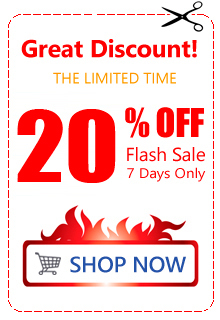 You can backup Blu-ray to H.265 MP4 or H.264 MP4 format, H.264 MP4 is recommended, it is highly compressed with H.264 codec. It is a small video format that has perfect compatibility with many portable devices and media players. 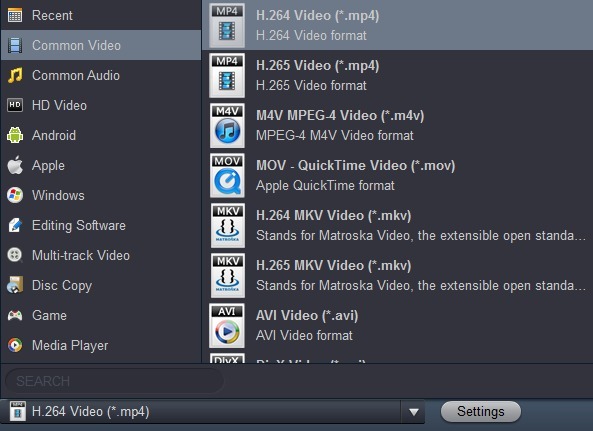 Just click on “Format” bar, go to “Common Video”, then select “H.264 Video (*.mp4). If your device supports H.265 codec, you can also compress Blu-ray to H.265 MKV, MP4 or MOV format. Click “Settings” button behind Format bar, to open “Profile Settings” window. You can change output video resolution to 1280 x 720, this is 720p resolution which can offer clear image for you, and it is more preferable by many portable devices such as iPhone, iPad, Android phone and tablet, etc and video sharing sites like YouTube, Facebook and Vimeo. Hit on the right-bottom “Convert” button to start backup Blu-ray to H.265 MKV, MP4 or MOV format. After a few minutes, you will get your Blu-ray movies converted. We don’t recommend you to convert Blu-ray to H.265 video, as the H.265’s technology is not widely adapted than H.264, the conversion time of H.265 is longer than H.264. Acrok often release the updated version that supports the latest discs, once you purchased the license code you can get lifetime updates for free. Compared to other ripping programs, Acrok is better in the latest discs support and rich optimized output formats, include the quality lossless output format. The best format we recommend is Multi-track Video -> Multi-track MKV output format, this format can maintain all the original subtitles, audio tracks and languages for you, and then you can choose any subtitle or language you want.